Elite triathletes train intensively and buy the best equipment available. And while that equipment is rather minimal when it comes to the swim and the run, it can certainly make a difference when it comes to the cycling portion of a race: a top-of-the-line tri bike offers huge aerodynamic advantages and can weigh a mere 18 pounds and change, after all. But at yesterday Nation’s Triathlon, a brave soul went for something a little different. Instead of dropping a few thousand bucks on a carbon tri bike, this participant opted to spend a few bucks for the rental cost for a Capital Bikeshare bike. 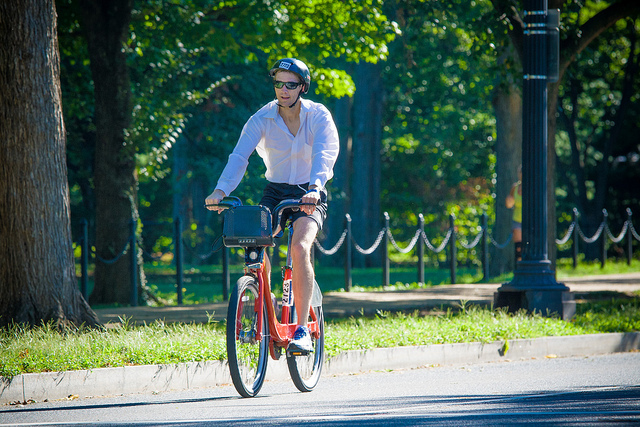 Beyond the absolute lack of aerodynamics built into the iconic red bikes, Capital Bikeshare steeds top out at 40 pounds and only have three gears. On average, most people only use Bikeshare for a mile and change; this brave triathlete went for the race’s 25-mile cycling segment. That triathlete was Jefferson Smith, 42, from Falls Church, Va. (Smith is pictured above.) He rode those 25 miles in just over two hours, at an average speed of…11.7 miles per hour. (By comparison, the overall winner rode that distance in just over an hour at an average speed of 24.2 miles per hour.) And depending on whether he was an annual member or not, Smith probably paid a fair amount in fees. No matter: the D.C. Department of Transportation said today that it refunded the fees, which came to $101.